Click the image to see the garage door open on a large, two-RV unit. A few months ago we wrote about a seemingly novel concept that came out of Southern California – RV storage condos. For prices starting at $90,000 and running up to $175,000 (big enough at 5,400 square feet to store two big motorcoaches), you could own a covered, secured, plush garage for your rig. At the time we made the case it seemed like an awful lot of money to invest in a fancy garage. And we took some heat from readers who thought we were way off base criticizing the idea. Well, maybe they were right. Those storage condos in Beaumont, California, have all sold out. And if you’d like to buy one from somebody who’s vacating, you’ll need to get on a waiting list. Even so, don’t expect to land a unit. According to Ted Deits, the man who developed the complex, when a unit becomes available it typically sells the same day. Ted has a new complex of units in Palm Springs, California, and nearly two-thirds of those are sold out. Maybe it’s a problem of perspective. While I don’t have any “indoor” RV storage facilities available in my little corner of Arizona in Quartzsite, I could easily find one for $30 a month. At the prodding of our readers, RVtravel.com did a little price survey based on (if you can call it so) “the real world.” We picked California’s Orange County, as that is a nearby drawing point for the RV storage condos we wrote about. Outdoor storage spaces (when they are available) are running from $189 to $400 a month. Park your rig inside a secure building? Plan on more, maybe far more – but get on the waiting list. Do you store your RV? How much do you pay? Answer this quick poll. So is Ted Deits’ idea really crazy? Let’s say you bought into the project when you could find an available $90,000 unit at the condo. Your banker takes your 20 percent down, leaving you to finance $72,000 at, let’s say, 4.8 percent. A 20-year note would set you back $467 a month in payments, and a 30-year mortgage will cost you $377 a month. That’s pretty close running to the “rent” you’ll pay at a rental operation. But as Ted points out, every one who has “invested” in one of his storage units and then subsequently sold it has earned a profit due to appreciation. So call it free storage, or even somebody paying you to store your RV in a secure environment. This all sounds great – for those who have the money. And as a couple of our readers have mentioned, if you have the Newell Coach to store, you can probably afford the condo. But what about Mr. and Mrs. happy owner of a 15-year-old Class C? They scraped their retirement money together to buy that motorhome to travel in as they checked off their bucket lists. But when they return from a few weeks on the road, and their city ordinance doesn’t allow them to park it in the driveway, how on earth will they come up with the scratch to pay even $200 a month to park it in an outside lot – if they can hack the waiting list in the first place? It’s a problem that is cropping up more and more often as residents across the country increasingly take pot shots at “unsightly RVs” and pressure local lawmakers to respond by clamping down with tighter parking and storage regulations. Are we headed for a time when the average working-class American will be forced out of the RV lifestyle, not for the price of an RV, not for the price of the fuel to drive it, but simply because they can’t afford to park it? If you have solutions, we’d love to hear them. Please comment on our forum. The RVtravel.com member-supported Stray Voltage Patrol is on the move, helping identify unsafe power pedestals in RV parks across America. Mike Sokol updates you on the progress of the program, and about an exciting new assignment for some of the 289 members to field test a brand new product to be introduced soon to the RV community. Read Mike’s update, and learn about a dangerous pedestal at one of America’s most popular RV parks. 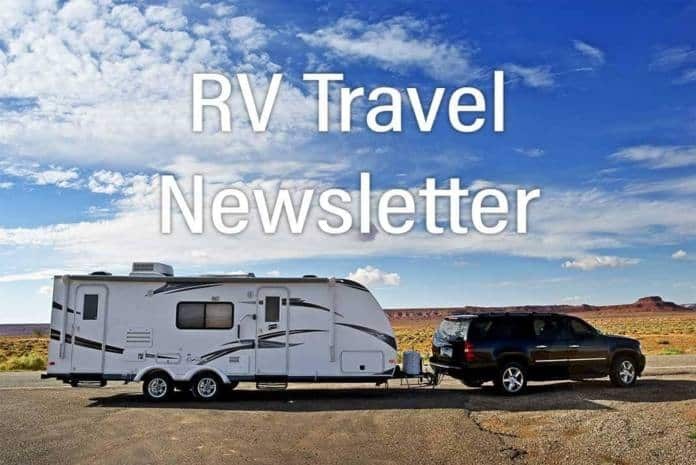 The staff of RVtravel.com works hard to bring you an honest, unbiased, valuable newsletter every Saturday. Readers help make it possible with their “voluntary subscriptions.” Even a pledge of $5, $10 or $20 a year is appreciated — that’s for more than 50 weekly issues (add another 208 issues if you read our RV Daily Tips Newsletter)! Many readers set up an ongoing subscription, most $5 to $10 a month. But even a one-time contribution of $5 or $10 helps make it possible for us to write about important matters, not just fluff to please advertisers and RV industry big shots. Enter a voluntary subscription. Use a credit card, PayPal or mail a check. With a Harvest Hosts membership (just $49/year), you can stay overnight at more than 600 wineries, farms, breweries, etc., for free! Harvest Hosts offers an alternative to traditional campgrounds, where members can meet interesting people, taste great wines, eat fresh produce and stay in peaceful settings. (RVtravel.com recently stayed in a blueberry orchard.) Learn more. • County forces evacuation of tenants from overcrowded RV park. • Cummins’ Garry Enyart elected Chairman of RVIA. • West Sacramento residents challenge RV parking ban on private property. • Oakland awarded $8.6 mil. grant to open housing, RV parks for homeless. • AZ State Parks bulldozes Native American sites in park development. • Mobile unveils new RV City plan for Mardi Gras. • Seattle spends hundreds of thousands of dollars to dispose of unwanted RVs. • Music lovers flock to UtopiaFest music festival this weekend, Nov. 2-4. • Forest Service closes recreation facilities around Lake Tahoe for the season. • San Francisco’s street RV residents under scrutiny – again. • Homeless Navy vet’s new tiny home runs afoul with county code. • Judge orders state legislator to vacate his RV he lives in. • Yellowstone on pace to attract more than 4 million visitors again. • “Tear Jerkers” rally on South Whidbey Island, WA. • Hipcamp will find you a campsite on a goat farm or at a hot spring. • Some Forest River, Coachmen motorhomes recalled. • Airstream recalls motorhomes: screen door fire issue. According to the latest U.S. Geological Survey National Volcanic Threat Assessment, 34 of the volcanic systems (about 21 percent overall) mentioned are either entirely or partially within areas managed as national parks or national monuments. Learn how volcanoes are categorized according to their threat level, and which ones made this list. The U.S. Army Corps of Engineers is the largest federal provider of outdoor recreation with more than 90,000 campsites across the country at more than 450 lakes and waterways. Many RVers consider COE parks the best places to camp. Military members on R & R are eligible for free camping. Here’s a quick look at Raystown Lake in Pennsylvania, which is a great example of what to expect at a Corps campground. Watch the video. This is your last chance (before winter). If you want to visit Yellowstone just one more time, this weekend is your last chance to drive to many iconic locations in the park before they close for winter prep. The west, south and east entrances and all roads, with one exception, will close to vehicle travel at 8 a.m. Monday, Nov. 5, so the park can prepare them for the winter season. Learn more. If you have small children or grandkids, think twice about showing them this homemade travel trailer: They may hound you into getting them one! What fun! Read more and see more photos. Hey, you deadbeats! Did you know that nearly a third of the 3.5 million people who visited a Nevada state park last year didn’t pay? According to a new state audit, uncollected entrance fees translates into an estimated $1.2 million in lost revenue for the state. Ouch! Read more. Do you plan to vote on Tuesday? You’d spend $15 to stay at a truck stop overnight with electric hookups (though you’d probably complain about the noise), and there’s a good chance you’re currently reading this, right now, on your computer. 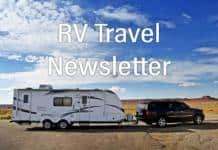 For those of you who do plan on buying another RV, it’ll probably be about the same size as your current one. On hot days you like to stick to cold water to drink, though you also appreciate iced tea and lemonade. You use a pressure restrictor when hooking up to water, and you think your Keystone Montana Fifth Wheel is a pretty good rig. All this and more, right here. No one needs to remind you that unless you have a reservation for some of the most popular National Parks you are unlikely to find a campsite. But Leslie and John don’t always follow the general consensus and sometimes the payoff works. Here’s how they scored a campsite at Arches NP. On the road, the compact Camp365 trailer looks a bit like a futuristic sleeping pod and weighs only 1480 pounds. Arrive at camp, engage the mechanical lift assist, and voila, in about 10 minutes the tiny camper transforms into a 100-square-foot cabin with a 7-foot 6-inch ceiling which can sleep up to six people. It’s built to be used any season. Read more. If you’ve been looking forward to a time when you didn’t have to sleep in your RV in a long line outside Sleeping Bear Dunes campground in order to get a campsite, you will have to wait a bit longer. The new reservation system you’ve been waiting for is being delayed. Learn more. How to winterize and preclean for next season – Work smarter, not harder! After Rich “The Wanderman’s” last trip of the season, it came time to shut down all the RV systems for winter as well as clean and sanitize the interior so it’s mostly ready to go next season. What works? What doesn’t work? Find out here. New Atlas takes a look at an all-new Class B motorhome made in North America rather in Europe, where many of the electric innovations have been introduced. One such camper van hitting American roads, the Ram Promaster-based Tofino from Canada’s Pleasure-Way, is a compact powerhouse with a lithium battery bank and a focus on electric appliances. Drop in the available solar package and you can start up an extended off-grid adventure. Read more. More problems crop up for Marcus Lemonis and Camping World as a law firm investigates securities issues. Faruqi & Faruqi, LLP, a leading national securities law firm, is investigating potential claims against Camping World Holdings, Inc. The firm is asking investors who lost more than $50,000 by investing in Camping World stock or options between March 8, 2017 and August 7, 2018 to contact it. Learn more. And read about yet another, similar Camping World lawsuit. • Already nervous RV driver led astray by expensive GPS. • Storing RV batteries during a harsh winter. • Don’t look a Class B white elephant in the mouth. • Class action lawsuit filed against Camping World. • What we learned about you last week (October 20-26). Our refrigerator works great on electric or gas as long as we are sitting still; as soon as we hit the road it gets to 58 inside whether on inverter or gas or off. We keep it closed while traveling. Any ideas? Comment here. I am looking to purchase an emergency radio and also a set of walkie talkies. We will be boondocking in the desert and near National Parks and will often not have phone service so want to be able to connect with civilization should we have an emergency. I also heard there is a device that you can push a button in an emergency and it will automatically go to emergency personnel and give the GPS where the call is coming from. I can’t find any information on what it is called or where to get it. I am looking for suggestions on which of each of these to purchase (not the cheapest but not ones that will break the bank – just ones that work well!). Comment here. My front split MCI Shades in my 2006 Allegro Bus will lower properly, but when retracting only the driver’s side retracts. Anyone had same problem? I contacted MCI and they sent re-programming info. No luck there. Comment here. Change from week before: No change; Change from year before: Up 32 cents. Change from week before: Down 3 cents; Change from year before: Up 54 cents. Need extra storage? Say no more. This two-pack of shelves hang in your cabinets, giving you two bonus shelves in the same amount of space. Use these in your kitchen, bathroom or closet and instantly double your storage. You’ll want to order a few sets here. Tell your friends to subscribe to this newsletter or we’ll send Baby Butch over to whomp on you! Want to hang a TV mount on an RV inner wall? Tap carefully, you may find there aren’t any “studs” to tie into. Now look on the other side of the wall. Is there yet another piece of thin paneling or laminate? If you’re dealing with a closet on the other side of your proposed TV hang-out, you may have a sweet setup. Carefully remove the wall in the closet and measure the dead space between the two walls. Is there room enough for a 3/4″ piece of plywood? Cut one to fit inside the space, then reinstall the closet wall. Mark the spots for your TV mount screws, and drill through the wall. From the TV side, use BOLTS, not screws, long enough to go completely through into the closet side. Then use fender washers and cap nuts to make a finished, non-snagging way that will securely mount your TV. Using wood screws as attaching hardware may pull out as the leveraged weight of the TV bounces down the road. Check your RV for plumbing system water leaks easily. With water in the fresh tank, turn on your water pump. After it shuts off, signaling the system is pressurized, it won’t turn on again until you “call for water.” If it does turn on, you have a leak. You’ve possibly used – or thought about using – your smartphone on a selfie stick to take some great shots of your RV travels. But if you’ve found it to be a bit flimsy and limited in its use, you may want to consider the Shurhold Camera Adapter, a rugged appendage that will attach to the 9-foot end of one of Shurhold’s telescoping handles, making it the Goliath of selfie sticks. Learn more. Wrap up those stiff hoses kink- and twist-free with these Coil n’ Wrap Velcro water hose straps. They wrap the hose up so tight you’ll have more storage space, which, as RVers know, can be hard to come by. Learn more. These fake parking violations are a hoot! Bring these to family functions, sporting events, or put them around the RV park for a good laugh. There are other similar products (some of them aren’t as polite) so poke around and make yourself giggle. Learn more or order. Roger saw an RV forum post on whether you need your own air compressor, as well as where to find certified tire inspectors/technicians. Here is his answer. This handy, space-saving battery organizer will save your junk drawer from drowning in loose batteries (because we all have that drawer). This organizer has space for 82 batteries and comes with a removable battery tester – throw out the ones that don’t work! Store it in a drawer, mount it on the wall, throw it in the toolbox and thank us later. Learn more or order here. So, what is a galaxy? One definition is: “A system of millions or billions of stars, together with gas and dust, held together by gravitational attraction.” That’s a good description but it leaves out the planets, moons, comets and asteroids that are certainly out there, and it also neglects supermassive black holes that seem to be at the center of every galaxy. And which came first: the galaxies or their black holes? Hmm. Here’s a fascinating article by Chris about that perplexing question and more. Make a Mexican hot pot. Traditional posole (or pozole), a specialty in Mexico on feast days and family occasions, takes hours to make and is made with pork. Thanks to canned turkey and canned white hominy, you can have hot and tasty posole quick and ready from your pantry. It’s an easy, one-pot treat to cook on the campfire, camp stove or RV range. Get the recipe. Keep the mud where it belongs…outside! Camco’s wrap-around step rug is just what you need for the wet, muddy months ahead. This rug comes in two sizes and fits both manual and electronic RV steps. Save your RV carpet and keep all that dirt outside. It’s a must-have for winter. Learn more here. Chris and Jim Guld, Geeks on Tour, did a lot of RV traveling this summer (as usual). They take a lot of photos and keep a blog, but there’s nothing like a map to bring it all together. It’s the perfect souvenir of your travels. You will have a full-size, interactive map. You can zoom in and out. You can also click on the markers to see photos of that place and maybe even a link to a blog post. Learn how easy it is to make your own personal map here. … from Geeks On Tour. Here is their most recent webcast: #155, Smartphone Apps: Install, Uninstall, Organize. Watch live or archives of past programs. The holidays are fast approaching! Who will you get this cute mug for? Now this is the size we’re talkin’ about! This “redneck” backscratcher will do two great things for the person you get it for: 1) please them, and 2) make them laugh. As the description says, “4 out of 5 shoppers at Winn Dixie said it scratched their backs better than their ex-wives did.” Ha! Order this for you or your spouse here (your arm will thank you). THIRD BASEMAN: An individual who accompanies a prospective buyer because the buyer feels he is better versed in haggling over the price of the RV and/or knows more about it mechanically, thereby decreasing the chances of getting stuck with a “lemon”. WALKING FIGURES: When the salesman knows for sure that the customer will not buy an RV at this time because he wants to check out some other dealerships, the salesman will give him a ridiculously low figure to try to beat, knowing that, in the end, he will have to come back to him. Wow! Just about anything and everything you would need for your truck is at Amazon. Plus, you’ll get instant savings with automotive coupons. No matter what make or model you’re driving, you’ll likely find what you want here, without wasting an ounce of gas or diesel driving anywhere. Explore the huge online store. Dome Creek Rest Area, McBride, B.C. “Once upon a midnight dreary, while I pondered, weak and weary…” Name that poem! If you said “The Raven” by Edgar Allen Poe, you are correct! This eerie museum is dedicated to all thing Poe and is located inside the oldest house still standing in Richmond. See the author’s original manuscripts, letters, personal belongings and much more. The museum’s collection is the most comprehensive in the world and hosts programs for scholars, authors, teachers and literary enthusiasts. Visit the museum website here to learn more. The first webcam watched a coffee pot. It allowed researchers at the University of Cambridge, England, to monitor the coffee situation without leaving their desks. This was in 1991. I saw a poster that said, “Have you seen my cat?” I phoned the number and told them I haven’t. I like to help where I can. Editor and Publisher: Chuck Woodbury (chuck@rvtravel.com). Managing editor: Diane McGovern. Senior editor: Russ De Maris. Staff writer: Emily Woodbury. Contributing writers: Greg Illes, Bob Difley, Richard Miller, Richard Mallery, Dave Helgeson, Janet Groene, Gary Bunzer, Roger Marble, Mike Sokol, Chris Guld, Julianne Crane, Chris Fellows, Dennis Prichard, J.M. Montigel and Andrew Robinson. Advertising coordinator: Gail Meyring. Marketing director: Jessica Sarvis. IT wrangler: Kim Christiansen. One of the things I looked for moving from Michigan was a home in better weather with an RV garage. I found a subdivision here in southern Utah that many of the homes have a big garage built into the house. No sun or rain beating up the RV. In Michigan the RV went in the barn. Lake Havasu City, AZ had sold ‘storage condos’ for years. They are building them fast and selling faster. Generally the RV sized units are 14’X14’X50′. Plenty large enough for any motorhome. I bought one for $35,000 a few years ago. They are selling new for $50,000 now. I rent mine out year round for $200 a month. Havasu is booming now and all new home have huge attached RV garages. The prices in this article are metro prices where land is a premium. The guy who rents my unit, lives in southern CA. Do the storage units have to have electricity? Most I’ve seen have lights, electricity (120V/20 amp). Its not for running the RV, but to keep a battery tender running. There are bathrooms and showers inside the complex for tenants to use. Havasu is a big boating town and many of the smaller units are used for boat storage. Wouldn’t San Francisco, as a sanctuary city, for illegal aliens also have to give sanctuary to all legal RVers? Maybe the Caravans should park there! We choose our lifestyle. If you can pay the rent, great. If you can’t move to somewhere where you can or pick another life style. No more whining without a solution! In Crossville, TN there is a subdivision that sells homes with attached motorhome garages. I know that several Vol State members live there. I do not know the price but not much more than homes in the area. Location, location… in the cornfields of central NY, 175K gets you that RV garage…and a 4 bedroom 1800sf house on 5 acres. Granted you may not want the brick and mortar base, and certainly don’t want NY’s socialist taxation, but it’s hard to see $175K for a garage with loft. I have to say, I’m a bit disappointed to find that I have to ‘join’ the forum in order to comment on a couple of the articles I read this morning. I would have thought that as a regular paying reader I would automatically have access to this section. Tommy, I don’t think that’s true, but perhaps Chuck or Diane can check into for you. Of course, I’m just the diode head around here, so perhaps I’m missing something.